In the course of my life I have had the good fortune to get to know many of the world's leaders and in my career to have served with many men of outstanding talent. In the long catalogue I recall only a few that I would describe without hesitation as truly great men. I have no hesitation however in placing Mahatma Gandhi in this very short list of the elect of our times. I only came into contact with him at the end of his life at a point when, in political terms at any rate, his power was beginning to wane or at least he was withdrawing from the front line of responsibility. The unavoidable accent on parti­tion in the Transfer of Power meant a bitter frustration of his life-long aims and ideals—to him it appeared more as vivisec­tion than victory. In such circumstances of partial eclipse he might have left a blurred impression, or appear to have done so; but from the first encounter my wife and I were both aware that here was a unique personality, one whose authority transcended the normal bounds of human leadership; one who quickly became a real friend. His role in the momentous events covering the last year of his life is now a part of history. He knew where his duty lay, and that it went beyond participation in the actual negotiations. Essentially it involved his exerting, his overwhelming influence upon the people themselves when the communal frenzy threat­ened to engulf the whole social order. I do not exaggerate when I say that Gandhi on the Maidan in Calcutta in August 1947 was one of the great incidents of the century, a personal tour de force bordering on a miracle. For those engaged in the study of mass psychology here is a supreme case history. With their passions roused and knives poised hundreds of thousands were diverted from seeking release through blood and revenge and were brought to re­cognition of their brotherhood through the love Gandhi, their physical captive, was able to instil in them. 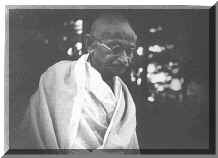 Such an example was the manifestation of his power as a Mahatma and far transcended mere political authority. It involved the assumption of personal responsibility which turned the final sacrifice of his life by assassination into a martyrdom that helped to heal the wounds of others. In his death the meaning of his life was finally justified for all to see. As they came in their thousands to pay their last respects by the banks of the Jumna and witnessed his frail body being consumed in the flames, the cry of "Gandhi is immortal" was a shout of triumph. I shall never forget that scene, and have often reflected subsequently on just how it was that Gandhi impinged so deeply on our era. The shock waves of his death reached out across the world. I think the secret was that he symbolized a profound challenge to the prevailing trends of the 20th century. Not for nothing has it been described as the age of violence, with every conceivable technique of personal and public pressure exploited to achieve the objectives of material power. I think there was a universal recognition that his response to this challenge was highly original. His whole concept of confronting force with non-violence was not just the dream of a visionary but an approach to the heart of the matter, a call to the conduct and aspiration of the individual and a demand upon self-control without which civilization, however sophisticated in other respects, must ultimately collapse. When asked his views about the desirability of having an Admiral for Viceroy I am told he pointed out that he did not object to dealing with military men, for their stock-in-trade was discipline, and controlled force as used by armies and navies was at least preferable to the uncontrolled violence of the mob. He commanded world attention and respect not only be­cause of the originality of his approach to the grave problems confronting his country but also because he was throughout consistent. The suggestion that he was devious and unpredictable is, in my submission, based on a failure to follow the longsequence of his words and deeds. Like other great revolutionaries before him he sought to conserve and not to overthrow. Remarkable evidence in support of this contention is to be found in his attitude to Swaraj in so far as it might affect the future rela­tionship of a free India with a Britain whose power he was striving to remove and supersede. The above sketch presupposes the retention of the British connection on perfectly honourable and absolutely equal terms. But I know that there is a section among Con­gressmen who want under every conceivable circumstance complete independence of Britain. They will not have even an equal partnership. In my opinion, if the British Government mean what they say and honestly help us to equality, it would be a greater triumph than a complete severance of the British connection. I would therefore strive for Swaraj within the Empire but would not hesitate to sever all connections, if severance became a necessity through Britain's own faults. I would thus throw the burden of separation on the British people. The better mind of the world desires today not absolutely independent States warring one against another but a federation of friendly, interdependent States. The consum­mation of that event may be far off. What better example could there be of his political insight and moral judgment which of course was reflected in his great disciples Nehru and Patel? Without relying on any of the modern techniques he was a supreme master of mass communication. Instinctively he knew the appropriate place and time to perform the appropriate symbolic act which could bring all to an awareness of his aims. This attribute alone had the hallmark of genius. In achieving this unison he was deeply suspicious of all artificial aids. He once told a member of my staff that he was really too old to master the mysteries of radio: he was not, he said, in principle against using it altogether, but he had to know whom he was addressing, whether it was five or five lakhs. So when he finally consented to speak over All-India Radio at the time of the Punjab crisis he asked to do so on the basis that he was addressing his audience—in this instance the refugees at the Kurukshetra Camp—directly and exclusively. Here again, far from being old-fashioned, he was probably ahead of his time. The sincere message may well need the closed circuit. In the dark and difficult days ahead the light of his example continues to shine and his still, small voice to be heard above the din of rival ideologies and insults. He had the greatness to embody the oppressed and their sufferings, and to seek truth wherever it might be found. By his standards a change of heart could be even more important than a change of mind. To borrow the famous phrase of Anatole France, "He was a moment in the conscience of mankind." 'Mahatma Gandhi 100 Years', Gandhi Peace Foundation, 2009.